The Hillsborough Transit Authority TAMP is available here. 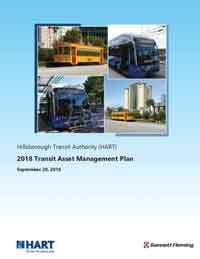 The Hillsborough Transit Authority (HART) Transit Asset Management Plan formalizes HART’s ongoing program for managing its capital assets across their whole lifecycle. The plan was published in September 2018. It addresses FTA’s requirements as listed in 49 CFR Parts 625, § 625.25 and documents HART’s efforts to initiate, implement, and advance asset management practices for improved lifecycle management, better maintenance practices, extended useful life, reduction of total lifecycle cost, reduced risk, as well as increased asset efficiency and performance. This document includes the following sections: . The modal scope of this document is: Transit Only. The asset scope of this document is: Bus, Rail, Transit Assets by Mode.